The Greek Diet–Lose Up to Ten Pounds in Two Weeks! 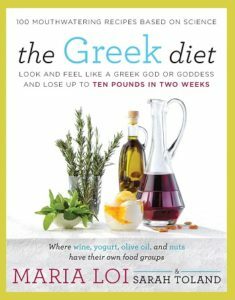 (@HarperCollins) by renowned chef Maria Loi and former Olympic athlete Sarah Toland is a revisit to the world’s oldest diet by going back to the original source–Ancient Greece. The authors use a traditional Mediterranean approach they say can help readers lose weight easily and healthily. The book provides 100 traditional Greek recipes as well as new research showing why they believe this diet is the healthiest food plan in the world, especially for positive effects on the heart. They list The Twelve Pillar Foods that their research has shown can burn fat and prevent disease. All interesting reading for anyone looking for a diet that could work while you eat unprocessed and delicious foods!